I made another Christmas card today. I hope you are not tired of seeing Christmas my cards yet. lol My goal is to make at least 100 this year, so I really should work on these all through the year. I'm not even on half way yet, but I'm slowly getting there. For this card I followed the great sketch at CropStop blog. I used the lovely paper from Provo Craft. I used the Classic Santa stamp from Stampabilities. Around it I used some Tim Holtz's Brushed corduroy distress ink to give it a more vintage looks, but unfortunately you can't really see this in the picture (you can only see abrown smudge in the left upper corner - I swear this is there intentionally, it's not just dirty lol). Speaking about distress inks ... I got an e-mail from one lady who asked me why do I only use just one or 2 distress inks while there are quite some different ones. Well, I only have 4 (Brushed corduroy, Spun sugar, Weathered woods and Shabby shutters), that's why I only use those. ;) Back to my card ... I colored the image with Faber Castell watercolor pencils. I made the pins myself (I used plastic star shaped beads and headpins). Ribbons are from my stash. I wrote the sentiment myself. Good luck with your challenge too! Love the tip for making your own pins ... I'll have to look through my bead stash to see what I can create with ... love the classic Santa too ... thanks for going vintage with us at jingle belles. Oh yum - I love a good barbeque but I'm on a restricted diet for now! Brilliant card - so much fun and brilliant layout! 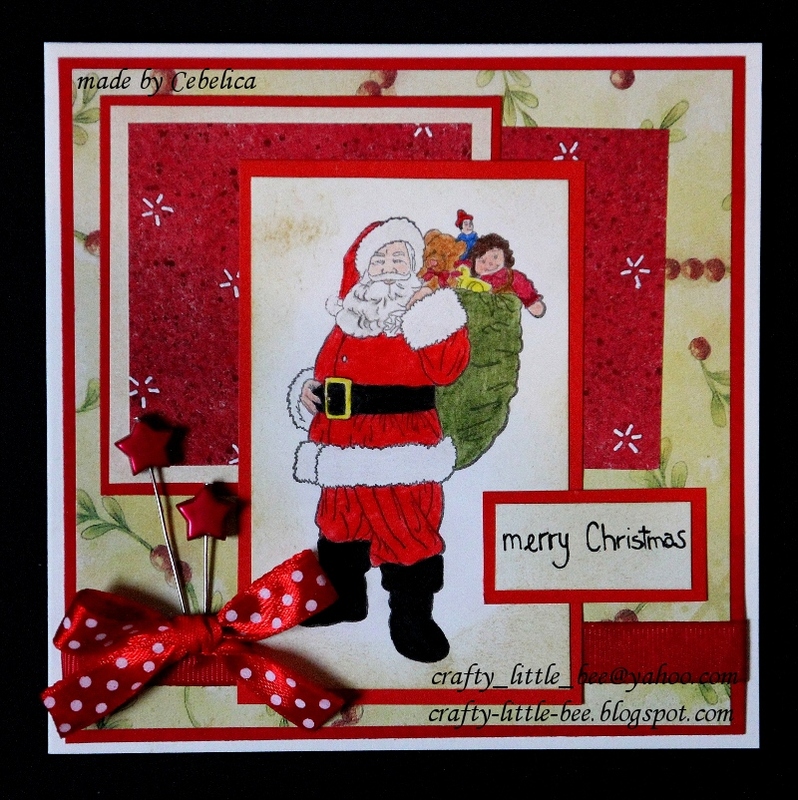 Gorgeous christmas card Cebelica, love the fab image. Sounds like you've had a really lovely day. Hope you enjoyed your ice cream. what a fun and fabulous card! i love that santa image and the awesome sketch you have used! i ♥LOVE♥ it! Cute and thanks for playing in the CropStop Challenge. Love the layers and pretty spotty bow - great vintage Christmas card! Gorgeous holiday card! You're so smart to make your Christmas cards in advance. Lovely design, details and coloring! Those star pins are terrific! This is lovely Cebelica, well done on starting your Christmas cards so early, I always end up doing them in a rush!! Ho! Ho! Ho! Thanks for sharing this project with us on the CropStop challenge. Fabulous card! I love those star stick pins! Thanks for playing along with our CropStop Sketch Challenge. What a great layout to feature your wonderful vintage Santa. Splendidly done!